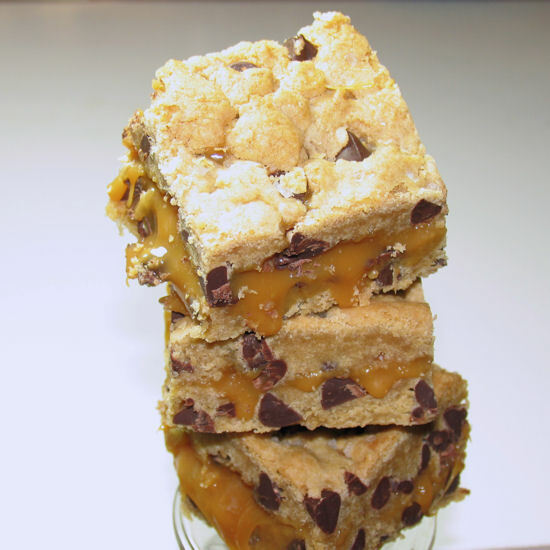 But about these cookie bars, they use the best chocolate chip cookie recipe which is chewy and scrumptious, adds a gooey layer of salted caramel, and a sprinkling of salt for a sweet/salty combo. These cookie bars are absolutely divine. And I wasn’t very eager to share! My husband and I ate most of them, but I did share a couple with my sister, because I’m that nice! Hehe. I mostly wanted to get them out of the house to resist temptation. 🙂 But you should totally make these… they’re worth turning the oven on!!! Preheat oven 325 degrees F. Grease a 9-inch square baking pan; set aside. In a medium microwave-safe bowl, combine the caramels and heavy cream. Microwave on high for 2 minutes, or until the caramels are melted, making sure to stir every 20 seconds. Press half of the cookie dough into the prepared pan with either your fingers or a spatula, smoothing the top. Pour the hot caramel over the cookie dough in the pan and spread into an even layer, leaving a small border without caramel along the edges; sprinkle the caramel with sea salt. Take the remaining dough and flatten bits between your fingers to create shingles; place the shingles on top of the caramel, slightly overlapping them until all the caramel is covered. Smooth out the top layer of dough. Sprinkle the bars with additional sea salt. Bake the cookie bars for 30 minutes, or until the top of the bars are light golden brown and the edges start to pull away from the pan. Cool the bars in the pan on a wire rack to room temperature, then refrigerate for about 30 minutes to allow the caramel layer to set. Cut into squares and serve. Store leftovers in an airtight container at room temperature. Well, aren’t these wicked little treats! I would eat all 16 of these myself, I can tell….but I may have to make them in order to find out. 🙂 Thanks for sharing and I’ve bookmarked. I sometimes get in a cooking rut. Sometimes it is just the market I visit is just plain boring. I switch markets and then once again I am inspired. I love your dripping carmel and the chewy brownies, I would so have to give these away to my neighbors as I don’t think I would have the self control just to try one.